Colorado State Forest Service and firefighters throughout Colorado have studied wildfires over the past several years to learn how to mitigate damage, if not prevent a building from catching fire. The fire intensity and duration determine the final result of resistance and/or damage to your farm homestead and surrounding barns and structures. The techniques they developed are called FireWise Techniques and they help create zones and defensible spaces around your farm and surrounding structures. Always remember that plants placed next to a structure are fuel to ignite that structure. As we go through cycles of drought, we need to consider the flammability of vegetation. Native plants are more resistant to fires, but there is no plant that is fire proof. Evergreens are highly flammable due to their oil and pitch content, regardless of their water content. Mowing the grass and keeping it regularly watered can help prevent a fire and buy more time for your safety or for firefighters to arrive and mitigate the damage. With dry grass and weeds, it is recommended that within 30 feet of any structure they must be mowed to a height of six inches. The first defensible zone is a space that is anywhere from 15 to 30 feet from your home buildings. You can have plantings but use deciduous shrubs that are low to the ground and placed right outside that 15-foot space. For the placement of plants within your 15 to 30-foot zone, it is best not to plant trees and shrubs in clusters. Pruning the bottom branches of trees between 10 to 15 feet off the ground makes it harder for fire to climb a tree because there is no ladder fuel. Keep low shrubs away from trees for this reason. Do not have overhanging limbs from trees onto the roof of any building. Keeping trees and shrubs well-watered will help in their resistance to fire. Pruning away dead limbs, thinning out plants and removing debris from around them adds to a safer landscape. 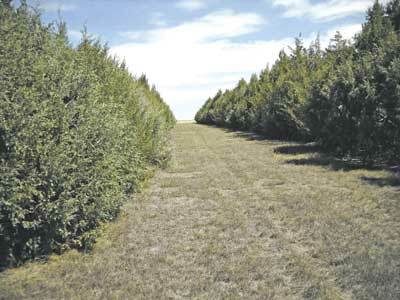 Most every farm has an established windbreak and it is recommended to keep grasses mowed around the windbreaks. Dead trees and/or dead limbs need to be removed. Any trees that need to be thinned out such as diseased trees would be helpful. Any trash that gets blown up against a windbreak needs to be removed. On the plains, high winds often bring a tumbleweed called Russian thistle. It can get piled up against trees or any structure. These are highly flammable and could be considered ladder fuels. The fire would climb vertically to the top of a tree or building quickly. If there are any ditches, consider keeping them mowed and burned periodically. If you are considering burning a ditch, check in with the local fire protection district or sheriff to see whether there is a ban in place in your area. They can also tell you whether you need a permit to burn. Don’t burn unless the wind is between five to 15 miles per hour. Burning should also not occur within 24 hours before or after a major frontal change as shifts in wind direction and speed create an unstable atmosphere. Follow all local rules and regulations before burning any debris on your property. Some farms burn trash. Trash needs to be burned in a metal receptacle with a wire mesh on top to trap lit embers. Stay with the fire until it is completely out. If your farm has a propane or butane tank, it needs to be 30 feet away from the home or any building. If you have CRP land, create a break between CRP land and your land. Take a walk around your home and buildings and see if you have wood chips or other flammable debris up next to the building. Any amount of time you can give yourself to allow firefighters time to travel to your home is a defense against fire. The other defense is not to do welding or any kind of fire-causing work outside on a windy, dry day that could ignite any dry debris nearby.